"Unconventional Warfare in the Ottoman Empire" is a comparative study of unconventional warfare practiced by the Turkish (Ottoman) military in relation to the Armenian genocide that took place during World War I. 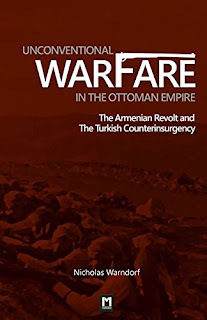 The author has bravely tackled the fascinating (and still highly sensitive) subject of the Armenian genocide dispute, from the perspective of Armenian insurgency and the corresponding Ottoman military response to it, in the form of COunter-INsurgency (COIN) operations - 'asymetric warfare' to use the more up-to-date terminology. I was particularly struck by the fascinating comparison made by the author with regard to the British counter insurgency 'experience' during the 2nd Boer War of 1899 -1902 and the way that the appalling British treatment of Boer civilians helped form the blueprint for Ottoman COIN operations during World War I (as a former member of the British military serving in Northern Ireland during the 1980's - the euphemistically termed 'Troubles' - the parallels are not lost on me: I had first-hand personal experience of counter insurgency warfare against a tough, and utterly ruthless insurgent opponent that was - supposedly - British like me too. It just went to show that there are no 'nice rules' for defeating an insurgent enemy, only effective methods). Few people seem to realise that it was Great Britain that 'invented' the concentration camp, and that the Nazis just 'borrowed' the idea - whilst tweeking it a bit with understandable classic German efficiency - to make a far 'superior' genocide of their very own. Why should the Ottoman's have reacted any differently to their own insurgency issue, when countries like Britain and America (Philippine -American War) presented them with the guidelines on how to go about achieving it in the first place? Another important point that the author makes in the book is that the Turkish regular soldier of the time was tough, stoic and incredibly brave; the majority of the Ottoman forces involved in the Armenian Revolt were, unfortunately, not first rate soldiers, but irregular troops with ethnic divisions and a commensurate lack of military discipline when dealing with civilians. Sadly, murder and fear can be very effective 'force multipliers'. I highly recommend Mr Warndorf's work to anyone with even a passing interest of the subject, but I especially recommend it to serving members of the Armed Forces (of any nationality), particularly those with experience in Iraq and Afghanistan ( it's also pocket-book size, so doesn't take up much space in your kit, lads!). Finally, anyone wishing to delve deeper into the subject of the Ottoman military of the C19th/ C20th can't go wrong with buying anything from Edward J. Erickson in my humble opinion. by Nicholas Warndorf (Author), Manzara Verlag (Editor), Mehmet Remzi Demirel (Illustrator) . . . Historical Archives and the Historians' Commission to Investigate the Armenian Events of 1915 demonstrates the vital importance of Ottoman and other relevant archives in Turkey for the study of the Armenian question. Historians, assisted by newly discovered or recently published materials, must continually reassess events of the past in order to achieve a rounder view. The Armenian events of 1915 are certainly no exception. This study encourages further engagement between the policy-making and the scholarly communities by indicating the . . .